First Congregational Church of Granby CT Sunday service. What's the difference between a Sunni and a Shia? What are Islam's principle beliefs and practices? Is it really a religion of peace? What is Ramadan, and why do Muslims fast? Is there really a chapter in the Quran about Mary? Is it true that Islam recognizes Jesus, Adam, Noah, Moses and Abraham as prophets? Want to know the answers to these and the multitude of other questions you may have about Islam? Imam Sami Abdul Aziz, founder of the Islamic consulting firm Common Ground Services, would welcome the opportunity to explain Islam, and answer any and all queries you have. Passionate about educating others to fight ignorance, hatred, and fear of Muslims, Sami and his consulting team speak throughout Connecticut spreading the message of peace, which is at the core of Islam. 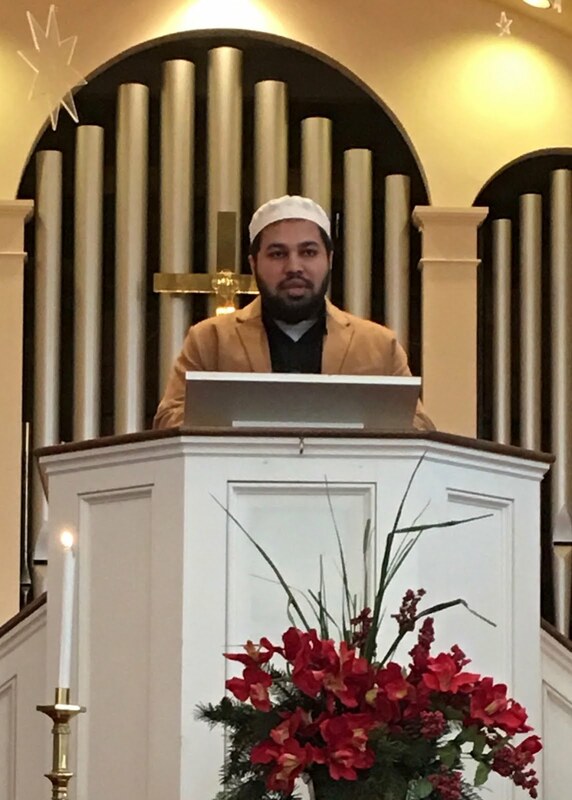 Sami spread his message Sunday, January 22, 2017, partnering with his wife Vjosa Qerimi-Aziz, vice president of Common Services Consulting, when they participated in First Congregational Church of Granby CT's church service, and presented their introductory Islam 101 during the after service lunch. Church members enthusiastically welcomed them. 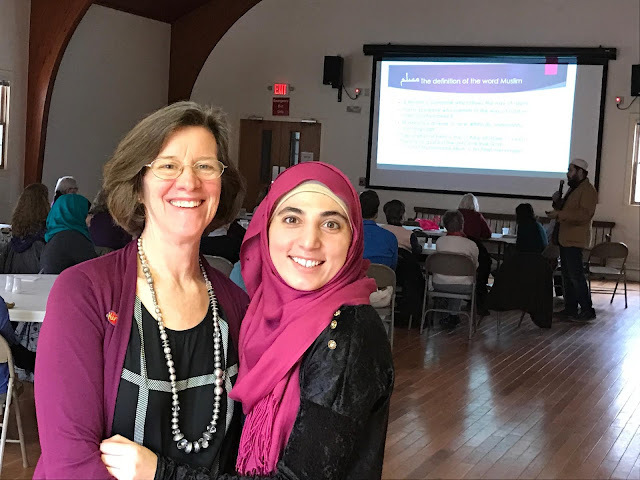 Sami and Vjosa are on a mission -- a mission to ensure Muslims and Islam are understood and accepted, not merely tolerated (and certainly not rejected outright), as part of our diverse, multicultural United States. Vjosa Qerimi-Aziz reading from the Quran 19:16-34. Sami is an American. His background is extensive. He serves as Imam for three organizations: PrayerSpark.com, a global interfaith service, Lighthouse for Humanity, and the Bloomfield Muslim Community Center. Additionally, he is Muslim chaplain at Wesleyan and Quinnipiac universities. And to make sure he has no spare time, Sami is a Doctor of Ministry candidate in Islamic Studies at Hartford Seminary. 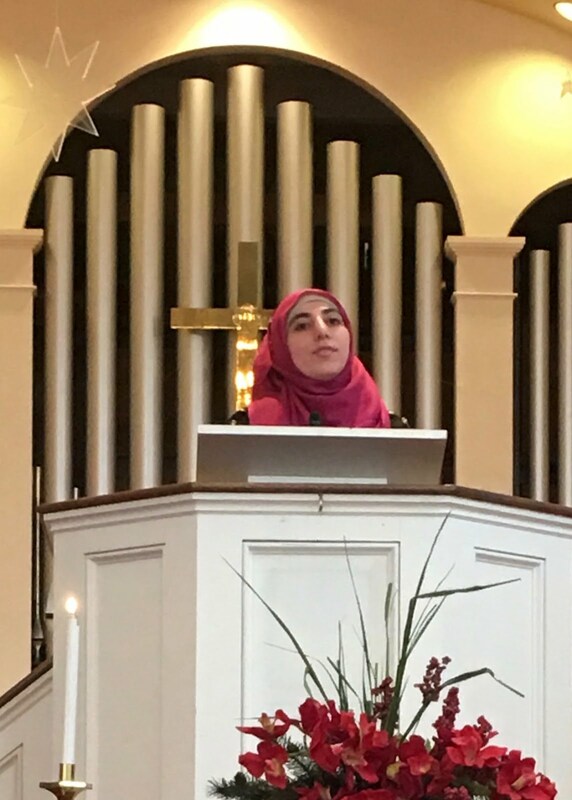 Their messages about Muslims and Islam, along with the their plea that "we are just like you, patriotic Americans wanting to live in peace and harmony," left us with greater understanding of our uniting similarities. Communication, collaboration and co-operation are the pillars of a strong, sustainable, peaceful community. Reach out to Sami. He'll answer your call. Assalamu alaikum; peace be upon you.